We live in a dull and repetitive time for cinema. Sure, we get some stand out films that thrive with originality, but it’s a rare feat to surprise your audience with something truly unprecedented or unique. For every Swiss Army Man or Greasy Strangler, we get 10 remakes. Alejandro Jodorowsky is one of those flames in film who, even at 88, continues to burn brightly with wacky and outlandish work. 2013 brought us The Dance Of Reality, the first part of a surreal autobiographical trilogy. Here comes Part 2…and boy, is it a hard film to review. 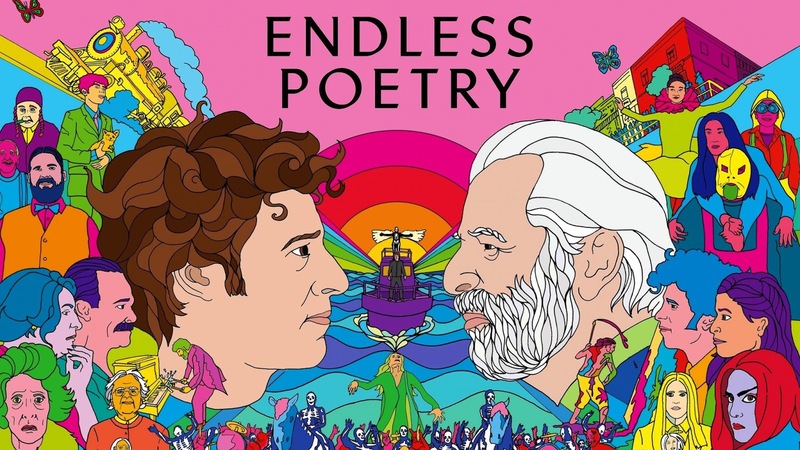 Endless Poetry is one of those artistic marmite films that divides audiences almost directly down the middle. For every review that labels this a masterpiece or a modern classic, there’s one that calls it ‘pretentious stodge’. It certainly requires an open mind, or at least the right frame of mind, to enjoy it. It’s pretty relentless in its ‘madness’ and if you’re not enjoying it within the first 10 minutes, it’s safe to say you probably won’t enjoy the remaining two hours. Every frame is packed with so much symbolism and meaning that it would be fruitless to try and decode the entire film. I’m sure a lot of it only means something to Jodorowsky himself. For those with a less analytical mind, this is just two hours of incoherent and meaningless drivel. If you’re an arty intellectual, this could be a whole world of wonder and enchantment, but for me, I honestly don’t know how I feel. Funnily enough, this was the exact same response I had to the first film in this soon-to-be trilogy. I will put my hands up and say that, for the most part, I just didn’t ‘get’ it. I respect the artistic merit and the fact that it is a great film technically speaking, but for me the onslaught of outlandish and surreal imagery became tiring and less effective as the film went on. Take a film like Sausage Party, using the swearing as an example. In small doses, it is effective. When it’s in every sentence, it loses the power and becomes tiring. The film is infectiously joyous with its saturated colours and ‘fun’ feel, and you can certainly sense Jodorowsky is having a bloody good time behind the camera (and occasionally in front of it). But the over-the-top surrealism becomes irritating as the film progresses and makes you long for a bleak and depressing tale of real life like I, Daniel Blake. As I said, Endless Poetry is technically a great film – the acting, visuals, direction, music, it’s all top notch filmmaking. But the style itself, and the narrative delivery, is perhaps a little bit too ‘out there’. If I took some mind-altering drugs before watching it, I’m sure I’d have different things to say. This film could be the basis for the best ‘trip’ of your life. But unfortunately, watching Endless Poetry left me clock-watching and waiting for the surreal battering to end. Endless Poetry is something I neither recommend nor advise you to avoid. I just don’t know.